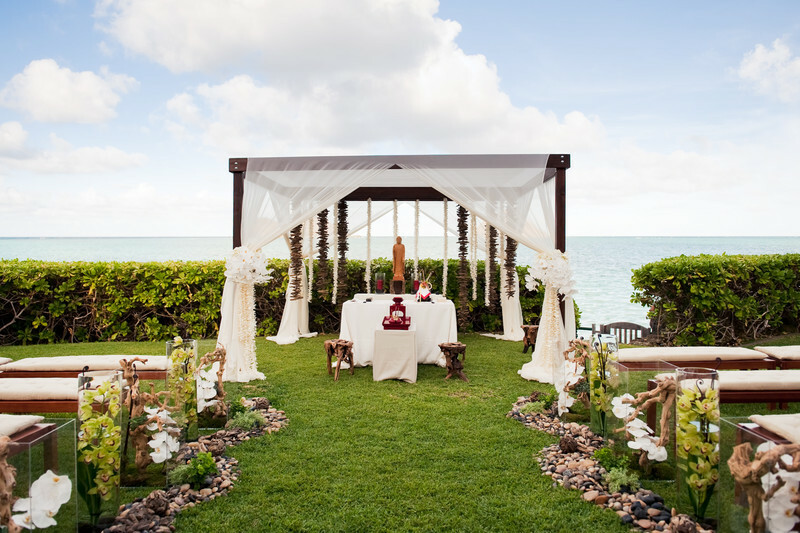 This was the ceremony setup for a Japanese wedding at Paul Mitchell Estate in Lanikai, Oahu, Hawaii. This location offers amazing ocean views, a cool ocean breeze, and a lot of lawn space to have both a ceremony and reception outdoors for a large guest count. The estate allows for a variety of setups at the same time, including guest arrival space, a cocktail area, reception, and ceremony. The house is also abundant with architectural details that are great for photography. If you are looking for a very unique place to get married on Oahu, the Paul Mitchell Estate should be one of your top considerations.